Lately I have been posting about how to enjoy the outdoors during the summer, but I decided it was time to bring up an ugly topic – ticks. They can be a worrisome problem, but with certain safety measures they may be avoided. 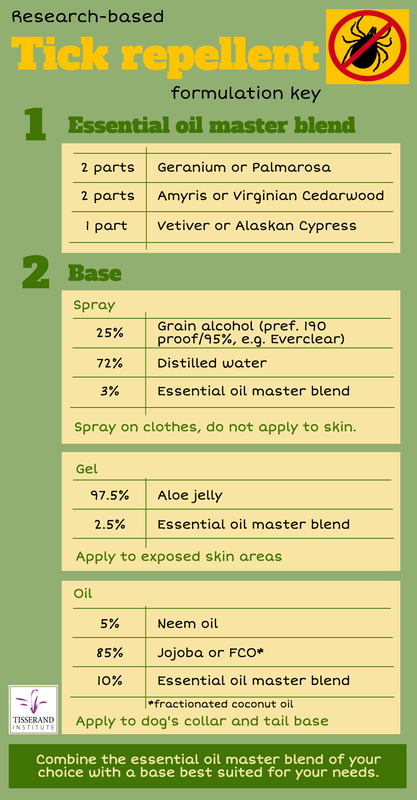 Wearing long pants and long sleeves in areas known for tick infestations can help, but essential oils can assist, too. He has included a formula for dogs with the instructions to put 1-2 drops of the blend on a dog’s collar or the base to its tail. Be aware, however, that this blend is not safe for cats. Cats don’t metabolize essential oils in the same way that dogs do and should not be exposed to this blend.